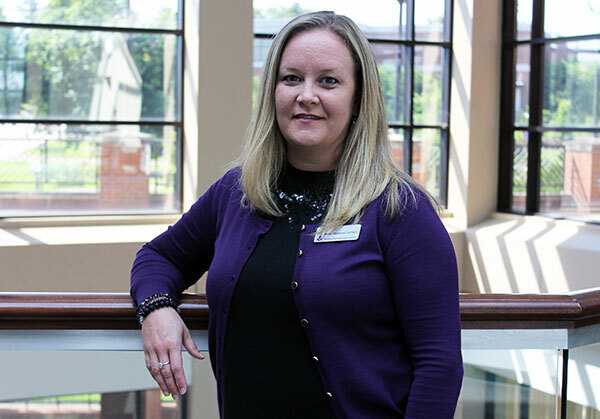 Betsy McDaniel is a graduate of MGA's Occupational Therapy Assistant degree program who went on to become its director. Title: Occupational Therapy Assistant degree program director. "During my teaching career at MGA I have enjoyed working with students who are interested in occupational therapy or other rehabilitation science fields at all levels. I have had the pleasure of seeing many of them complete the OTA program and go on to become excellent occupational therapy assistants who are able to improve the quality of life for many people living with a disability. I have also had the pleasure of being the Experiential Learning liaison for the Department of Occupational Therapy, which has given me the opportunity to work with other OTA faculty and faculty from other departments, including Jasmine Brown from the Respiratory Therapy program, to develop and implement interdisciplinary learning opportunities for School of Health Sciences students. In addition, I have had the honor of serving as the regional chair for the Georgia Occupational Therapy Association in the Middle Georgia region for the past two years. This position of service has given me the chance to network with occupational therapy practitioners across the state and offer local OT practitioners exciting continuing education credits and information on current changes in the field of OT." "I am a graduate of the OTA program at the former Middle Georgia College - now MGA - and returned to teach in 2003. The program gave me an excellent education and I was honored to be considered for a teaching position when one became available. Occupational therapy is one of the most rewarding career fields I could have chosen and I now believe that teaching occupational therapy and preparing excellent OTAs to enter the field is the best way to give back to the profession." "I love the students at MGA. Over the years I have seen so many first generation college students get a degree and change the trajectory of their lives. Some of these students are new freshmen right out of high school, but many of them are non-traditional students seeking a career change. MGA offers life-changing education for students of all ages and all socioeconomic backgrounds, and that is one of the most rewarding things for me to see as an instructor." "One of the most important skills anyone entering a healthcare profession needs to have to day is professionalism and interpersonal (or 'people') skills. Being professional includes things like punctuality, integrity, dependability, and professional appearance. Professionalism will help students to build trust with patients and colleagues. Interpersonal skills are also extremely important, since OTAs will be working closely with individuals who are recovering from an injury or living with a disability, they need to be able to communicate with patients and families in way that conveys care and concern as well as respect." "Students might be surprised to learn that I love to camp with my family. I don’t think I come across as an 'outdoor' person, but camping is one of my favorite pastimes."